Eleanor Stallcop-Horrox, a Seattle native, studied at Central Washington State College and the Curtis Institute of Music in Philadelphia. As a 1989 Bel Canto competition winner, she pursued advanced studies in Siena, Italy with Maestro Walter Baracchi of La Scala. Her oratorio and symphonic credits include Ein Deutsches Requiem by Brahms, Mendelssohn’s Elijah, Gloria by John Rutter, Handel’s Israel in Egypt and Messiah, Haydn’s Lord Nelson Mass, the Bach Magnificat, Beethoven’s Missa Solemnis and Symphony #9, the Verdi Requiem, the Faure Requiem, Serenade to Music by Ralph Vaughan Williams, Vier Letzte Lieder by Richard Strauss, Waldmärchen by Mahler, and Wagner’s Wesendonck Lieder. She has appeared with Orchestra Seattle and the Seattle Chamber Singers, Choir of the Sound, Soli Deo Gloria in Colorado Springs. Lake Union Civic Symphony, Seattle’s Broadway Symphony, Bellevue Symphony, the Philadephia Singers, Colorado Springs Chorale, and Cascadian Chorale, Bellevue, WA. Her operatic roles include Santuzza in Cavalleria Rusticana, Leonora in Fidelio, Giunone in Il Ritorno d'Ulisse in Patria, Sarah in The Ballad of Baby Doe, Cercatrice in Suor Angelica, the Bridesmaid in Der Freischutz, the title role in Tosca, Georgetta in Il Tabarro, the Nurse in the world premiere of William Penn for the Philadelphia Tri-Centennial. She has sung regularly with Seattle Opera, Colorado Opera Festival, Eastside Symphony and Concert Opera of Seattle, Willamette Concert Opera, Bel Canto NW and Bellevue Opera. She was the 1989 Winner of the Bel Canto Foundation and sang at their Buon Viaggio Gala in Chicago. She has also been heard in recital at the Teatro Rozzi in Siena, Italy, and the Governor's Gala at the Governor's Mansion in Olympia, Washington. 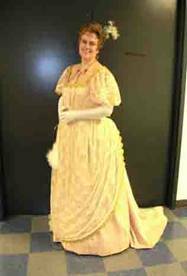 She is a student of Ellen Faull and has been a Seattle Opera Regular Chorister since 1997. Her work in opera and voice has also included studies with Martile Rowland, Wayne Conner, Julian Patrick, Marianne Weltmann, Dean Williamson, Philip Kelsey, David Barela, David McDade, Blanche Thebom and Tom Sunderlund. Her upcoming performances include Farewell, Vienna, a musical play on the life of Erich Wolfgang Korngold, book by Ralph Wells, at the Scottish Rite Temple in Portland, OR, Ah-Joe in Leoni’s L’Oracolo with the Willamette Concert Opera and Meditation at Oyster River by Glenn Stallcop with the Phoenix Symphony.